First things first: Revolutionary Road is good. Actually, it's very good. We're a little surprised to be typing that. We were more than a little cynical about it, pre-viewing, as it was Oscar bait, dealing with a subject we have little patience for (middle-class suburban ennui) and directed by Sam Mendes, who is perhaps most famous for directing American Beauty, one of the PPCC's most disliked films. Yet all the things that didn't work for us in American Beauty suddenly came together perfectly in Revolutionary Road, and the same story of dead souls struggling to live in repressed, picture-perfect suburbia was both touching and incisive this time round. 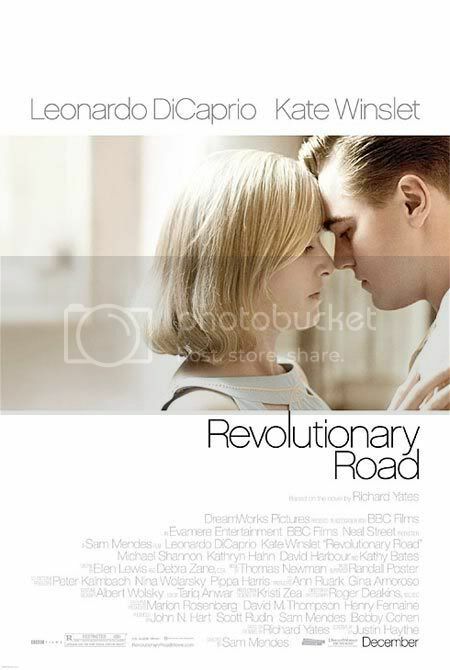 We think one of the major points in favor of Revolutionary Road was the setting. Putting the story in 1950s suburban America changes the tone from the self-indulgent, self-obsessed 1990s family in American Beauty, to a period renowned for its conspicuous economic growth (post-war booming America) and wide-spread cultural paranoia and hegemony (McCarthyism, post-Hiroshima, Cold War). Haven't we all seen those satirical parodies of 1950s public service films and advertisements - with those scrubbed, squeaky cheeks, angular haircuts and eerie, plastic smiles? Setting a story about ennui there makes a lot of sense. In fact, we feel like we've seen this story before (didn't Betty Friedan cover this?). Frank (Leonardo DiCaprio) and April (Kate Winslet) Wheeler are, on the surface of things, the perfect couple: a comfortable, dainty home in suburbia, two shiny kids, a shiny car and a shiny life. Yet, already in the first ten minutes, we see the deep cracks in their relationship. They have everything, and yet they are unhappy and feel trapped: often dissolving into screaming fights over nothing. They both know why there is such a deep, underlying dissatisfaction. Again and again, they express existential angst at having become "like everybody else" - they are just drones. Desperate to be the meaningful, "special" people they want themselves to be and see themselves as, they each cope in their own way: Frank with a thoughtless extramarital affair and constant griping, April with an idealistic plan to flee to Paris, where the people "really live". April eventually convinces Frank of the Paris plan: and, for a brief while, they are happy again, filled with hope and excitement. Yet, the more they plan their escape, the more suburbia reaches its tentacles around to stop them: their friends subtly mock them, an unexpected promotion is offered to Frank, April becomes pregnant. Meanwhile, their kindly real estate agent (Kathy Bates) has introduced them to her mentally ill son, John (Michael Shannon), who doesn't seem mentally ill so much as completely, willfully detached from the norms of the highly restrictive society they're all living in. This gives him the freedom to voice the Wheelers' most unsayable tensions and, after one particularly scathing articulation, things come to a dramatic, dismal end. The depth of this film was remarkable (and very enjoyable!). The subtle plays of emotion and characterization were fantastic - April's flinty, resigned strength, the weaker and more cowardly Frank's manipulations, and the scenes with John were incredible! In this regard, all the performances - even Frank's unfortunate girlfriend (Zoe Kazan), which is a relatively small role - are amazing. Kate Winslet deserves all the accolades, baited or not, because the depth and expressiveness of her performance was completely compelling. Leonardo DiCaprio seems to even mimic the performance style of old 1950s actors: the typical mannerisms of an all-American tough guy from that era. I wanted in. I just wanted us to live again. For years I thought we've shared this secret that we would be wonderful in the world. I don't know exactly how, but just the possibility kept me hoping. How pathetic is that? So stupid. To put all your hopes in a promise that was never made. Wow. We definitely hear you, April, given that the PPCC still hasn't abandoned the childhood notion that we'll one day become famous writers... or movie critics... or screenwriters... or cultural philosophers... or something, anyway! Yet, as the Wheelers never really realize, much to their detriment, the sooner they accept their unexceptional, unadventurous, unglamorous, monotonous lives, the sooner they'll find that ever-elusive contentment and satisfaction. Nirvana! Even if you realize this on an intellectual level, it's still hard to accept on an emotional one - we certainly haven't given up hope of becoming "wonderful in the world"! Even though we admire films like Saaheb for showing us that, you know, being ordinary can be just as meaningful as being great. This movie even got us thinking about the whole cultural thing again: when you're raised to believe in the pursuit of an individualistic American dream, where everyone should have big dreams, where hard work and big hopes are enough to guarantee success, it sets you up for a big fall when you realize that you might just be, well, mediocre or unlucky. Hey, the American dream can be very useful - it's motivating, and it glorifies ambition, optimism and the meritocracy. Indeed, we at the PPCC are often gently teased by our non-American friends for the optimism and confidence Americans stereotypically demonstrate at public speaking or job applications. Once a career center adviser told the PPCC: "I always need to tell the American students to tone down their cover letters, and I need to tell the British students to sell themselves more." Large generalizations - but there's a grain of truth. Growing up in America anytime post-WWII pretty much guarantees that you'll have that optimism and individualism ingrained in you. That's what makes The Incredibles so resonating: it shows that the stereotypical American ideal - where everyone is "super" - is, by definition, impossible. Because if everyone is super, no one is. Look at us. We're just like everyone else. We've bought into the same, ridiculous delusion. Devastating - and spot on. As you can see, a thought-provoking and intelligent film. Highly recommended! P.S. One of the most confounding references in the film, however, is John: is he supposed to be John Forbes Nash? The coincidences - diagnosed schizophrenic who underwent shock therapy, mathematics PhD, 1950s, East Coast, "John" - seemed far too many to ignore! P.P.S. Also, what's the significance of making a film like this now? On the one hand, we can see some similarities (comparing the threat of Communism and nuclear war to the threat of terrorism, for example, and how this plays out into the common man's fears) though there are also some stark differences in today's society compared to yesterday's (the glorification of diversity, as well as the actual diversity, the economic recession). Interesting to think about. So much to discuss! Can't wait to see the film. Is that Kate Winslet on the poster? She seems so different somehow. As for being great, wanting to be great, distinguished, all of us seem to suffer from it. Whether we have the confidence to go with it or not. And somehow, the feeling that we could have made it if only we were more hardworking, dynamic, clever, witty or whatever is even more suffocating. Don't know how one does achieve nirvana. Nice review..will have to see this one. But I cannot believe that you did not like American Beauty. I cannot speak for the American experience, but the suburban family with dysfunction was pretty well etched, I thought. And those secondary characters - the psycho marine neighbour, the gay neighbours [That scene where they introduce themselves - I will never forget it] and then the marine's wife - Allison Janney. Man!! Wonder what kind of hell her life was that she could function only as a zombie ;). Will have to see this one. Hope American beauty comes back on one of the movie channels. Would love to see it again. Banno - That is indeed Kate! I thought she looked faaabulous in the film - much prettier and more elegant than her Titanic days. Re: nirvana, this isn't the appropriate forum for it, but I sometimes wonder if the path to enlightenment doesn't mean also giving up on your dreams - since aren't dreams the biggest type of grasping/attachment? Interesting! Srinivas - I think what I disliked about American Beauty was how self-indulgent and self-obsessed the characters seemed... to them, I just wanted to tell them, "Go volunteer at a soup kitchen!" or something, instead of manufacturing "problems". It seemed like a glorification of privileged ennui! But I know I'm in a minority on this one - most of my friends really liked it! I haven't seen the film and didn't plan on seeking it out but your review is giving me second thoughts! What I found interesting about its premise was that unlike most movies about running away to realize your dream, this is one of the few in which it is the woman who wants it badly enough to risk everything. It seems to be a recurring motif about this time period lately - at least in the things I watch. In Mad Men too, Peggy Olsen's character and her ambitions are compelling and devastating. I don't know if you're on the Mad Men bandwagon but I strongly recommend it if you aren't. Not having seen the movie, I don't know about the real life connections but as far as the second question goes: it's never a bad time to talk about the realization of dreams is it? Amrita - See it! It's faaab. And YES, you've pinpointed another thing I loved about it: how badass April is, and how April's the driving force and strength of the relationship. Haven't seen Mad Men, but have heard tons about it. Alas, it's not appearing in my desh! Oooh, I'm sooo excited to see this! Going to catch it next Monday. I also hated "American Beauty"...but this sounds much better. Plus, I love Leo and Kate(and yes, loved them together in "Titanic" in my teen days). I'm so glad the PPCC liked it!